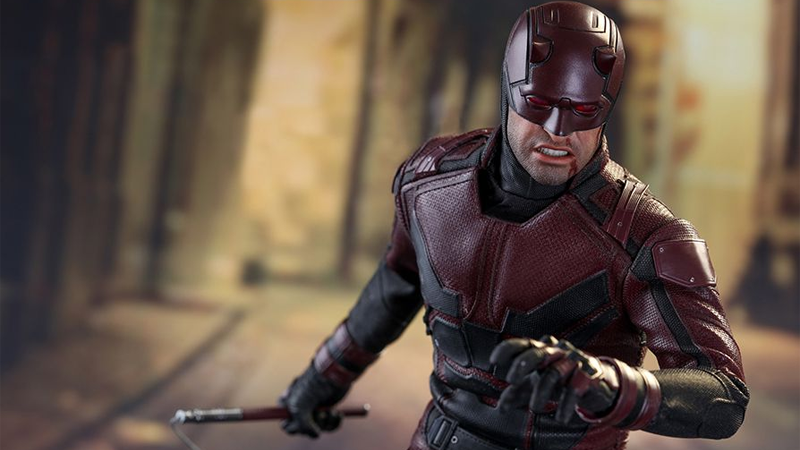 Netflix’s Daredevil costume got a pretty solid update for season two, so it’s probably for the best that we’ve had to wait a while for Hot Toys to get round to making a Daredevil figure of its own. Now we get to see it in all its updated glory. After teasing the figure at San Diego Comic-Con earlier this year, Hot Toys has now let its miniaturized Matt Murdock come out of the shadows, and he’s looking rather brilliant. Based on the tweaked costume for season two, the 30cm-tall figure comes with a themed base depicting a tiny fragment of the run-down “city” of Hell’s Kitchen, three sets of billy clubs (attached in an extended staff, separated, and in “nunchaku mode” for you to pose Daredevil swirling them around), and alternate faceplates to depict the lower half of Matt Murdock’s face as either neutral or angry and injured. It’s not the most elaborate of Hot Toys recreations—and it doesn’t really need to be—but it’s a perfect recreation of the Netflix show’s costume. Considering there’s not all that much Daredevil merch to come by even now, it’s great to see Hot Toys tackling the Netflix side of Marvel too (Jessica Jones figure when please??). Daredevil is expected to be out in the summer of next year—he’s not available for preorder just yet, but you can expect him to be around $230 or so when he is. Head on over to the link below to see a few more pictures of the figure up close.